Japan Display aims to shut the door on VR's oldest problem. The problem with using smartphones to power VR headsets is simply that their screens weren't made for displaying virtual reality. Smartphone displays, although often high-resolution, just don't have the refresh rate that VR demands, leading to "screen-door effect," where you can make out the lines between pixels. But a higher pixel count alone isn't enough; so the new display also has a 90 Hz refresh rate and very fast response times of between 3ms-6ms that will considerably reduce motion blur. 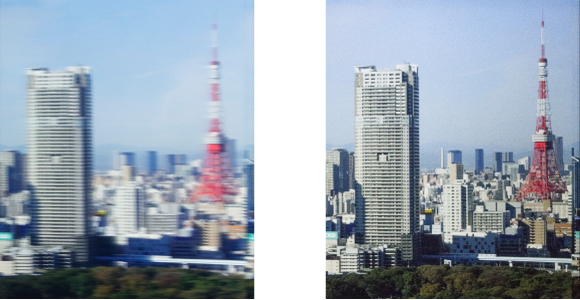 The picture below demonstrates this, with the left shot illustrating the motion blur you can expect from a normal phone screen and the right from JDI's VR screen. Seeing the difference additional pixels can make, the company has confirmed that it's also working on a screen that will support 800 pixels per inch. Where exactly JD's new display and its 800 PPI successor will fit into the VR market is unclear. The HTC Vive, Oculus Rift and PlayStation VR all have 90Hz (or higher) displays already, so the real development here is in pixel density -- all three have much lower density displays. JD will either need to prove this tech works across a larger screen size (to make it suitable for smartphones), or put a lot of work into persuading headset makers to switch technologies for the next generation of VR headsets. Either way, it's encouraging to see companies focusing on tackling the early problems of VR.